Combine all your energetic signals, like feelings and sensations, with the impulses and imagination of your mind to tap into your inner reservoir of Body Intelligence. Discover how growing your “BQ” provides a treasure trove of resources for creating more healing possibilities, deepening connections with yourself and others, and an expanded architecture of consciousness. In an era that tends to overvalue intellectual prowess and digital relationships, its common to ignore, override or depreciate our natural birthright: our full spectrum intelligence! Body intelligence practices (e.g., yoga) utilize body sensations, breathing, and conscious movements to generate reliable and enlivening insight that cannot be arrived at merely by thinking. In this class, we’ll learn to shape and embody ideas, feelings, and impulses with the practice of “bodifying” to release inertia, debris, or blind spots. Familiarize yourself with the full spectrum of your body’s wisdom as you try on high-power and low-power yoga poses, shift between contraction and expansion, and integrate rather than dismiss, opposite poles of experience. 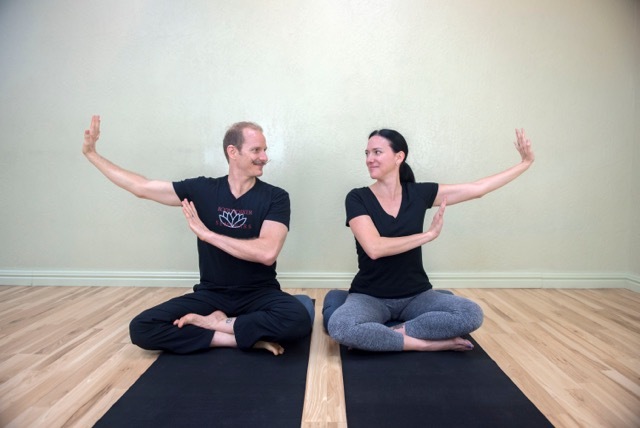 Become aware of the primary centers of emotional anatomy to develop your felt sense of wholeness with inclusive “presencing” practices—in any pose, any relationship, or any event. Many of the BQ practices we’ll explore will fine-tune your intuitive prowess by revealing your full-body “yesus” and “noes”. Explore moving practices of “matching” to catalyze clarity, integrity, and close the gap between what your’re feeling and expressing. Get curious and open to wonder as we experiment with the fledgling field of Embodied Cognition in harmony with the primordial wisdom of your body, mind, and heart, on and off the mat. If you’d like to delve in deeper and build your BQ, we invite you to join our two-night experiential webinar on April 30th and May 14th. Everyone is welcome and you can attend from wherever you are, live or after the session times. Grow your intuition, creativity, and body intelligence with practices to recognize your full body yeses and noes, while you melt fear in favor of flow.